As the governing body for soccer in New Brunswick, Soccer NB is responsible for training coaches from grassroots to national team level. With the increasing number of players registering with clubs across the country this represents a considerable challenge. In order to meet this challenge we follow the Canada Soccer Pathway (LTPD) and tailored our Coach Education Program to this model. As a result, a two-streamed education program has been developed in conjunction with the NCCP and each provincial/territorial that is the best method to meet the needs of both developing coaches and the sport itself. Each of these Streams include a number of workshops designed to prepare coaches for working with players in a specific stage of development as outlined in the LTPD Model. The Community Sport Stream has four workshops based on Stages 1, 2, 3, and 7 of the Long Term Player Development Model. The first three workshops, Active Start, FUNdamentals and Learn to Train, deal with soccer training and the importance of physical literacy for players up to 12 years of age. The fourth workshop in this Stream is called Soccer for Life and focuses attention on working with players between the ages of 13 through to “masters soccer” which includes a wide array of participants who play for fun and fitness, those who enjoy recreational soccer, as well as those who prefer to play competitively but not at the high performance level. Active Start Workshop: Completion of a workshop totaling 3 hours (Active Start Stage of Development – players U-4/U-6). No pre-requisites required. FUNdamentals Workshop: Completion of the workshop totaling 7 hours, plus take NCCP Make Ethical Decisions Module (Fundamentals Stage of Development – Boys U-6/U-9 and Girls U-6/U-8). No pre-requisites required. Active Start/FUNdamentals Workshop: Completion of this combined workshop totaling 10 hours, plus take NCCP Make Ethical Decisions Module (Active Start Stage of Development – players U-4/U-6 and Fundamentals Stage of Development – Boys U-6/U-9 and Girls U-6/U-8). No pre-requisites required. Learn to Train Workshop: Completion of the workshop totaling 14 hours plus take NCCP Make Ethical Decisions Module (Learning to Train Stage of Development – Boys U-9/U-12 and Girls U-8/U-11). No pre-requisites required. Soccer for Life Workshop: Completion of a workshop totaling 14 hours, plus take NCCP Make Ethical Decisions Module (Soccer for Life Stage of Development – Boys U-13 and Girls U-12 and older). No pre-requisites required. Note: coaches do not undergo an official evaluation process in the Community Sport Stream, therefore they are not designated on their NCCP transcript as a Certified Coach. These workshops provide training only in developmental stage specific areas of coaching. With this in mind coaches taking part in these workshops will receive the status of Trained Coach (or will be considered In Training if they have still to complete a module of the particular workshop they have taken). The Licensing Stream is aimed at those who are more serious about their coaching development and requires that coaches reach a minimum standard of competence in a practical coaching environment. Each coach is, therefore, formally evaluated and graded by Staff Evaluators at each stage of the process. This process begins with the C Licence, which involves a total of 32 hours of facilitated learning plus time allocated for formal assessments. 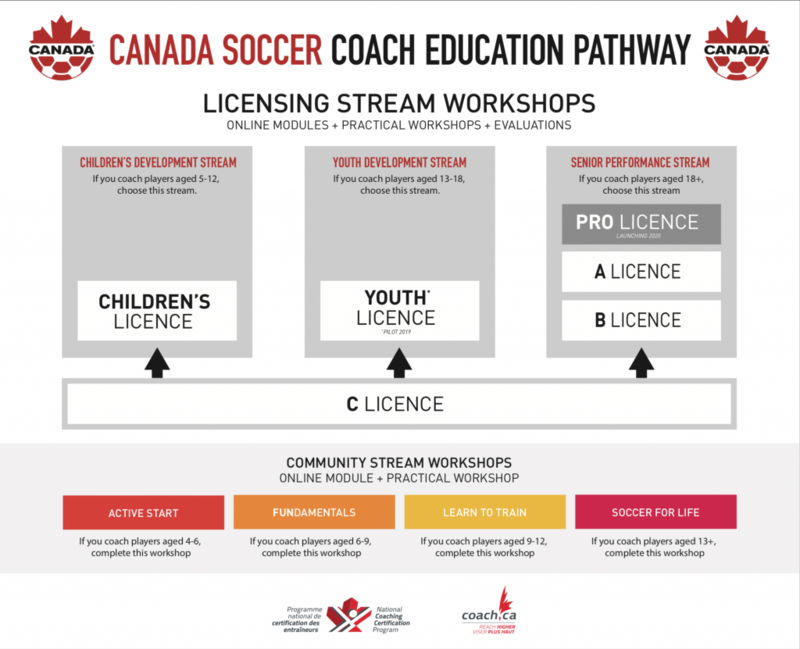 From there, coaches may enter the B Licence Program, which includes the B Licence Part 1 and B Licence-National and a total of 80 hours of facilitated learning plus time allocated for formal assessments or the Children’s Licence stream. It is aimed at coaches working with players in an environment where performance is a critical factor in successful coaching. The A Licence Program includes a total of 90 hours of facilitated learning, plus formal assessments, and caters to those wishing to make a career of coaching at the highest level. C Licence Workshop: Completion of a 32-hour training workshop and an official evaluation. B Licence-Part 1 Workshop: Completion of the training workshop totaling 40 hours and an official evaluation. Pre-requisites: Successful completion of C Licence workshop and evaluation. B Licence-National Workshop: Completion of the workshop totaling 40 hours and an official evaluation process (Training to Compete Stage of Development). A Licence Workshop: Completion of the workshop totaling 90 hours and an official evaluation process (Training to Compete Stage of Development). Each of the workshops within the program is built with an emphasis placed on the practical application of certain coaching skills, also known as “competencies.” These competencies are expanded upon as the coach progresses through the program and will range from showing an understanding of the rules of small-sided-soccer to running an effective practice with players in a high performance environment.